The lying was done. We had a surprise party, as suspected. That surprise, during which the weather was exceptional sunshine, meant Mr would not suspect further. So, confused but knowing family life can be confusing, he arrived at the address in Jacobstow prepared to babysit. But we had blithely lied. We had Friday night fajitas instead, with moderate beers, and the tired children (fed earlier) had moderate tears, and the grownups fell asleep in chairs. Saturday we mustered to Widemouth Bay, to walk on the beach with teeny whirls of snow. It was bound to happen, so Grandchild 3 fell in a pool to fill up her boots and go back to the car to shiver. 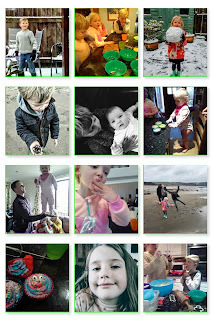 Grandchild 4 opened bare hands, bright pink, showing his collection - sea snails, he said, and helmet crabs - they don’t have their own houses, they wear other shells like hats, he said, that’s helmet crabs. Grandchild 1 was feral on rocks. Grandchild 5 cried, we guessed she was cold. On the way back to warmth we took a wrong turn, a pretty one full of thatch and moss. Defrosted, the children played indoors everywhere, we heard the thunder-music of their steps. Cupcakes were brought to being, and a red curry. Put on a show, we said to the throng, who were getting fractious again. Grandchild 1 has mastered the armpit fart - he can do elbow and knee versions also. 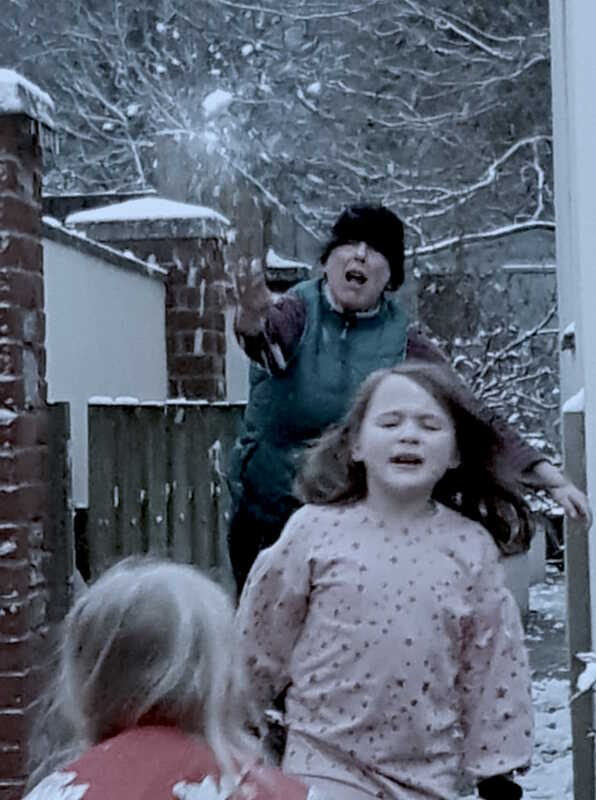 Grandchild 2 stops telling everyone to applaud or not applaud in order to read a message which she can spy scrawled into the snow that is settling on the garage roof. Grandchild 3 is not distracted. ‘Ladies and Gentleman!’ She proceeds with her ballet. Grandchild 4 does magic, but only if you close your eyes. Grandchild 5 needs to go to bed before her stares start turning us to stone. All are herded to bed, then the grownups stay awake and play charades and forget to be moderate, because isn’t that how charades gets played? A sacrilege if sober! Sunday starts a bit headachy, with the thunder-music, and the smoke alarms set off with a row of crispy sausage. It’s a bit snowy, enough for a cute postcard, not enough to keep us in. Grownups need the fresh air and coffee cure, children need un-cooping. Again a little snow falls. Hands cramp, babies fuss. Back to the warmth we go, armed with ingredients, for a mix of cooking and Scrabble and Twister and film gawping and arguments and collaborations and even total cooperation. Bliss settles. A lot of snow falls. Exceptional snow, for here, for this time of year. The roads are closed. Plans are changed. Wine is opened. After a feast, and a recovery period, there was only one thing to do. Well, two, but after Fat Beagle ate the first carrot nose and Dog the second, the snowman project was reassembled. Until dark fell, until we couldn’t feel our fingers, no one would admit defeat.